Recommendation systems rely on various definitions of similarities. These definitions while having numerous design factors in different domains help identify and recommend relevant content. For example, similarity between users, or items, are measured based on, but not limited to, explicit feedback such as ratings, thumbs up; or/and implicit feedback such as clicks, views etc; or/and based on composition of item such as tags, metadata etc. 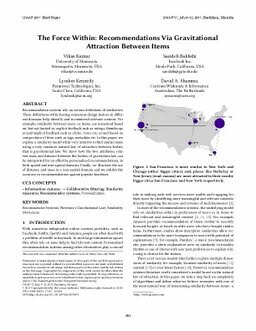 In this paper, we explore a similarity model while very intuitive to find similar items using a very common natural law of attraction between bodies, that is gravitational law. We show how the two attributes, relative mass and distance between the bodies, of gravitation law can be interpreted for an effective personalized recommendations; in both spatial and non-spatial domains. Finally, we illustrate the use of distance and mass in a non-spatial domain and we exhibit the accuracy in recommendations against popular baselines.